Many often assume that English is the only international language used in business. But according to Statista.com, Spanish is the second-most spoken language in the world. It is more popular for business than English in certain areas (most notably, parts of Europe). Thus, if you are applying for a job where the Spanish language is prevalent (and will be the primary one you use), then it may behoove you to prepare your resume in Spanish. Speaking Spanish fluently will certainly help you in resume preparation, but there are certain resume styles and writing guidelines that apply to documents written in any language. The Spanish resume templates shown here will help you in creating a document that best fits the type of job (or company) you are looking at. Why Use Spanish Resume Templates? Creating a resume may seem like a fairly cut-and-dry process, yet there are certain intricacies to it. This is where having a template to reference is helpful. It provides you with examples you can use to match the exact style you want and direction in creating your document. Once you have decided on a certain format, you can dedicate all your creative abilities to coming up with content. Organization: They show you how to structure the information you choose to include. Motivation: They can serve as a motivation to equal the quality seen in examples. Inspiration: They offer examples of what sort of content you should include. If an extensive work history is your best professional asset, you may want to reference chronological Spanish resume templates when creating your document. By providing details of your past jobs, such a resume shows your skills in action through the many accomplishments and experiences you list. If your professional profile is short on experience, then a functional resume might serve you better than one created using chronological formatting. This type of document showcases the many the skills and qualifications that make you a good candidate for job, making it easier for a prospective employer to look past your lack of work history when evaluating you. If you are still learning to write in and speak Spanish, your focus should be on getting the grammar and sentence structure right in your resume rather than on its format. In this case, you may just want to stick with basic Spanish resume templates. They will show you how to structure your information in a simple, straightforward (yet effective) way. Classic Spanish resume templates are a step from simple ones in terms of formatting. Rather than just following a general outline, they perfect the element of clarity. These templates emphasize matching the right style of font as well as header and content color with the right amount of whitespace to ensure that the reader’s attention goes where you want it to. 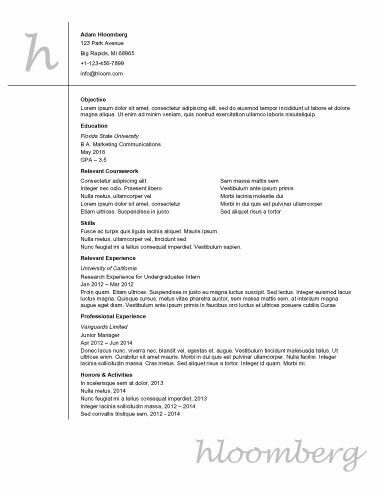 This style of resume works well when applying to large, established companies. Portfolio-style resumes that incorporate images are becomingly increasingly popular with jobseekers. These allow you to use less written content by conveying much of your information through the pictures you include (which is a plus if you are not yet confident in your Spanish writing skills). Such resumes are great if you are looking for a job in photography, modeling, or some other form of visual arts. The many Spanish resume templates shown here, while displaying a different formatting, all typically ask for the same information. That is because even while the preferred styles of resumes may change over time, the information employers value when reviewing job candidates remains the same (e.g., your past skills and experience, your educational background, your career objectives, and your contact information). While seemingly simple elements, these informational categories can provide more than enough information to allow companies to make an informed decision regarding your qualifications (provided you include the right content). Research the culture of the country or area where you are applying to determine whether you should include information such as your age, your relationship status, or other demographic factors here. Only list the city and state you live in if you do not want to include your complete home address. TheMuse.com recommends including your Twitter or LinkedIn profiles in your contact information. That said, only include them if their content is also in Spanish. Only provide high-level details of your most important career achievements and experience in this section. Do not state an on objective to your job search unless you are looking to advance into a leadership position. This section should be brief, yet still interesting enough to hook a reader’s interest. Only include skills directly applicable to the position you are applying for. State skills in a way that shows how they can add value to an organization. Use this section to incorporate keywords and phrases you notice in the job listing to help your document get past application screening programs. List your previous work experience chronologically, starting with your most recent position. Do not include reasons as to why you may have left a job unless you were only with the company for less than one year. Offer your readers context for your achievements by using detailed metrics to describe them whenever possible. List both the degrees you have earned and any professional certifications you hold in this section. Include your date of graduation if you just recently completed schooling. If you are currently pursuing a degree, list that your education is ongoing and/or offer your anticipated graduation date. Given all that is riding on your resume, you should definitely look to take advantage of every resource available to you when creating it. This not only includes the Spanish resume templates shown here, but also resume builders. These tools offer additional assistance such as guidance when creating your content and customization options based on your stated career path. All this added help can go far in ensuring that your resume works at attracting enough attention to warrant an interview. Once it provides with the chance to get your foot in the door, the rest is up to you.